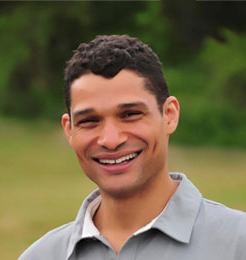 Adam W. McKinney is a former member of Alvin Ailey American Dance Theater, Béjart Ballet Lausanne, Alonzo King LINES Ballet, Cedar Lake Contemporary Ballet and Milwaukee Ballet Company. He has led dance work across the U.S. and in Canada, England, Ghana, Hungary, Indonesia, Israel, Italy, Mexico, Palestine, Serbia, Spain and South Africa. He served as a U.S. Embassy Culture Connect Envoy to South Africa through the U.S. State Department in Cape Town, Pretoria and Johannesburg respectively. Named one of the most influential African Americans in Milwaukee, WI by St. Vincent DePaul, McKinney is the Co-Director of DNAWORKS, an arts and service organization committed to healing through the arts and dialogue (www.dnaworks.org). McKinney was recently chosen as a School of American Ballet (SAB) National Teaching Fellow-an opportunity to engage in national conversations about diversity in classical ballet. McKinney sat as the inaugural Chair of New Mexico School for the Arts’ Dance Department for six years and is currently an Assistant Professor of Dance at Texas Christian University. He holds a BFA in Dance Performance with high honors from Butler University and an MA in Dance Studies with concentrations in Race and Trauma theories from NYU-Gallatin.